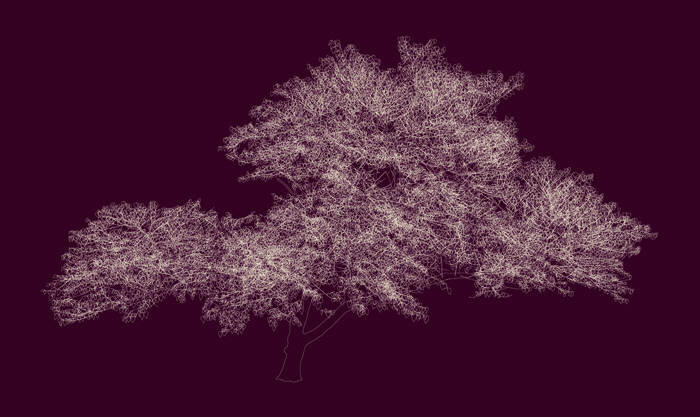 Andrew Millner -38º 39’ 16.66“N, 90º 18’ 43.6“W (redbud) – 2008 – lightjet print mounted to UV plexi – 45.5 x 76 in. This is the last week to view parts of the Media Matters gallery show at Foster/White. The full show was an exploration of novel materials and techniques by a slew of artists. Most of the sculptural works are already off the gallery floor, but several pieces are still hanging. I would like to focus on the works of Andrew Millner and Eugenie Tung as uniquely opposed meditations on time and documentation. Andrew Millner – 39º 18’ 53.5“N, 106º 58’ 55“W (black echinacea 2) – 2009 – lightjet print mounted to UV plexi – 27.5 x 57.5 in. Millner’s botanic images were meticulously hand-traced by stylus through computer, then printed on plexiglass. The result is a series of revelations by contrast. First, by extracting only his subject (a bed of wildflowers, a tree) and reducing it to its simplest representation, Millner reveals its complexity—details that would otherwise be invisible to the eye. Next, in printing the images onto the hard, glossy, richly colored plexiglass, Millner avoids the earthy, soft cliche of floral prints. By their very absence, the soft, organic qualities of the original organism that he can only represent become more apparent. Further, this organic quality is tied to decay and fecundation in our minds, and when we picture these flowers and trees in nature, it is easy to attribute some sense of subtle movement to them, not the perfect, ethereal stillness that we have in the synthetic prints. Flowers and trees are particularly tied to a cycle of budding and withering (’tis the season) and so the last meditation is not on the ephemeral, natural subject matter but on art itself and technology—the pursuit of preservation through representation, the power and limitations of this process. The works are even named with coordinates which (I trust) give the viewer the precise location where these trees and flowers beds were found. One could return to these places and find the flower beds withered or scattered…or perhaps still growing in new formations. The trees, one would hope, will be there, a few inches taller and fuller…but nothing is certain. This added use of technology (geotagging) to remind the viewer that these are documents of actual organisms in a fixed location—yet subject to the passage of time—is a novel and powerful meditation in its own right, in an age where nothing seems to remain in situ. 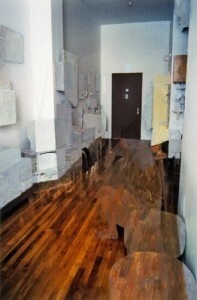 15 Lawton Street #41 – 2011 – mixed media – 30 x 20 in. From that concept, we turn to the work of Eugenie Tung, whose experience as an immigrant and itinerant artist has informed her series of painted photographs. 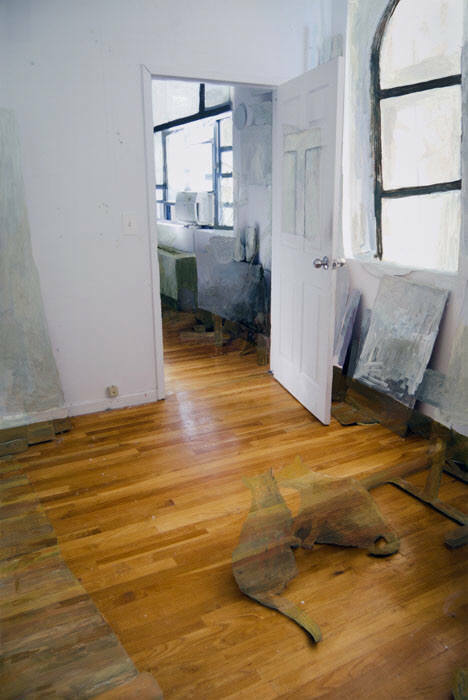 Tung gathered and printed large copies of photographs of former apartments as they were when she occupied them. She then doctored them with acrylic and marker to conceal her possessions, people, and pets. But she is not clinical in this and it is not damnatio memoriae. The blurry brushwork gives the impression of looking through a glassy ghost that blurs and makes unreal what is behind it, does not blend at its edges but leaves an indelible trace. In 15 Lawton St #41, she leaves shadows of frames and canvases and cats, giving their ghosts a melancholy aura. As with Millner’s work, the medium has as much to do with the work as the content and its execution. Photography has proliferated wildly a constant stream of photos is being created and shared by consumers worldwide. It is impossible to know how much of this is actually seen once published or reviewed in earnest long after the moment has passed, but I daresay that only a tiny fraction of it comes to have any lasting resonance. Photographs can be reproduced endlessly and edited seamlessly through digital doctoring, and so despite their ability to instantly capture an image we remain rightly suspicious of them. Even most mobile photos taken by consumers go through push-button processing of some sort. Here, Tung’s photos are uniquely altered by hand—a physical trace erasing the representation of a physical trace. It is impossible to leave a place precisely as one found it. Tung’s hand-painted erasure consciously does not revert these spaces to a pristine state. Is it the fallibility of memory or of imagination that will not allow us to see the floor as if it was never obscured by a pair of cats? Isn’t the blurry, foggy window about as accurate as any dimly remembered thing seen through the blurred fog of memory? Studies regarding memory indicate that even things we claim to remember with perfect clarity are often inaccurate, that these images and events are changeable over time. Tung’s work confronts this with an honest and humble hand while simultaneously addressing the sheer physicality of one’s existence in space and time and its inevitable disappearance. 15 Lawton Street, #30, living room area – 2006 – mixed media – 30 x 20 in. Both Tung and Millner are playing with ephemerality—the latter by defying it with the still perfection of representation, the former by one-upping the ephemeral through artistic negation. I recommend taking in both at Foster/White before they disappear. Artists from Media Matters are still on display on the main floor at Foster/White through October 27.